The Globe has just published another article on artificial sweeteners. I find it dismaying how many people would defend an inanimate substance, such as white/brown sugar, chocolate or artificial sweeteners, when none of those are necessary for our health. Similarly, I find it dismaying when I see my diabetic friend guzzling diet pop. Why not water? Sure, sweets taste good, and eating sweets make us feel good when we’re eating them. Afterward? Maybe not. But every now and then … sure. I’m not going to get pissy about a decent lemon tart every now and then. But the real nastiness is in sugary drinks, which have become the drink of choice for post-breakfast drinks for many, no? I used to drink them all the time: fruit juice, pop (soda) and iced tea. Water was something I only had when there was no other option, or if I was really hot. It seems strange now — my normal drink, my regular ingested fluid was basically sugar water. It wasn’t a treat, it was a staple. … because really, diet drinks taste like crap once you really taste them. And after that, what’s left? (Boy, that headline’s a stretch.) Anyway, Rebecca, a Chinese friend of mine says that if we drink cold drinks after or during a meal, it’s more likely that the fat in the meal will congeal in our stomach. This is one of the reasons why Chinese drink tea at meals — to prevent the congealing. (I thought it was because the water in China was so unhealthy it had to be boiled … go figure) So Rebecca says “drink more tea. Hot, but not too hot.”. If you know Rebecca, you know Rebecca knows. It also works for me because I have a low body temperature, and cold drinks tend to make my hands and feet cold. So I drink more hot tea, and feel great, Pu Erh being my tea of choice, but I’m cool with a lot of them, including Earl Grey. 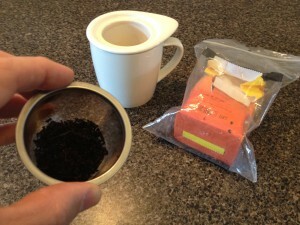 Pu Erh takes a bit of getting used to, but it seems to be smoother if not oversteeped. I just had some nice smooth stuff at Crown Princess restaurant in Toronto. Nice place. So there you go. More tea for thee? Over the past year and a half, I’ve been losing weight. Hopefully, I’ve only lost fat, but I don’t think the loss has been so extreme as to worry about losing muscle mass. I don’t think that losing twenty to twenty-five pounds over a year is very drastic, but I suppose that keeping is off is pretty nice. Over the next little while I’ll share with you some things that worked for me, because I’ve lost fat by doing them, but also because I’ve gained a bit back by not doing them. Case in point: Know the difference between staples and treats. Mentally, we often view staples as forming the bulk of the meal, while we see the treats as the dessert: the “fun” part. I seem to recall that the staples were characterized as meaty and salty, while the treats were sweet. Many of us have taken our cues from restaurants that package their meal that way. For example, a fast food meal would include burger and fries as the staples, a coke as the drink (gotta hydrate!) and a sundae or fruity pie as dessert. There: a complete meal. For those of us who either grew up that way or came to survive that way post-secondary school, we may have come to believe that you package a meal that way. Burgers and fries = staple. Tasty, but not so healthy = treat. In other words, a staple is something that keeps us healthy. The body needs it. It doesn’t hurt the body. We don’t need to compensate for eating it by working it off at the gym, nor do we need to insert something healthy into the meal to balance the guilt. Anything that a good nutritionist would recommend is a staple, in my opinion. We eat staples often, and often begin the composition of the meal with a staple. Treats, on the other hand, we eat for taste, not nutrition. We eat treats less often than staples, hopefully. Here’s how it works: to get healthier, we change many of our former staples into treats. For example, a hamburger might have been a staple beforehand, but if we want to be healthy, it has to become a treat. Why? Because a) we like the taste, so it’s a treat b) it’s not very healthy, so it’s not a staple and c) we should eat less of it in order to get healthy. 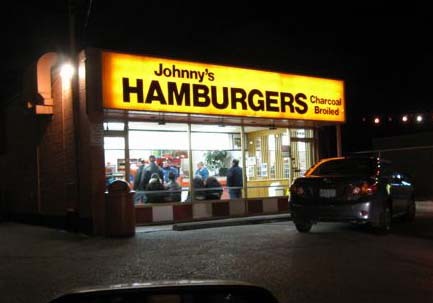 One result of this, in my situation, is that instead of grabbing a quick McDonald’s for dinner when I’m in a hurry (which could add up to three times a week) I now indulge in a Johnny’s hamburger maybe once every two weeks when I visit Scarborough. So now, a hamburger has become a treat. As we make this change, we become more discerning, where more and more food items that previously were staples become treats. For example, we can “treatify” pancakes (once a breakfast staple), muffins, danishes, lattes, deli sandwiches, anything on white bread, butter, lasagna, pasta with cream sauce, anything with gravy and so on. Imagine how many restaurant meals are presented as staples (implicitly, where “main course” = staple) but are best approached as treats. Try that the next time you’re reading a menu. Of course, there can be a sliding scale to this, where the “stapleness” or “treatness” could be determined by the food’s (admittedly qualitative?) health value … or where it stands on the scale between “medicine” and “poison”. But more on that potentially incendiary topic later. At any rate, besides the potential for weight loss, an upside of all this is that we would now place more responsibility on the hamburger to behave like a treat: it better be good. When it was a staple, it didn’t have so much pressure on it to satisfy our taste buds. This leads to the possibility that we might actually figure out what that burger really tastes like … and it might not be as good as we thought it was. But not Johnny’s, of course. It still remains a tasty treat, for an old Scarborough boy, at least. According to a recent story, the principal at a Wisconsin high school reduced fighting, weapons-carrying, and general lack of focus and discipline in the school by changing the menu.